A and N Motorhome/Caravan Services : How Does A Battery Charger Work? How Does A Motorhome Mains Battery Charger Work? "Hi Allan, Our motorhome is back up and running thanks to your expert help, advise and part. I cannot thank you enough in sorting out this problem and would certainly recommend you in the future. How Does A Motorhome Battery Charger Work? Everyone knows that a Motorhome/Caravan mains Charger starts off charging a Battery at 14.4v, then once the battery is fully charged, it drops down to 13.8v Trickle/Float, right? It doesn't, that is usually the way Car battery and 'smart' chargers operate. The best Motorhome or Caravan chargers, do not always function in that way. Although the operation may be only subtly different, the implications can be major, which we will explain below. A Car battery style charger will 'boost' charge at 14.4v and when the current being drawn by the battery drops below an amp, it switches to 'Float/Trickle' mode. The problem with this style of operation in a Motorhome/Caravan, is that the chargers can be left unattended for days, even months, so if the battery gets tired it may continually draw a couple of amps, or even more, at the 'Boost' 14.4 voltage. Therefore it will never drop down to the Float/Trickle charge rate. Obviously charging a dying battery indefinitely at 14.4v is going to lead to a disaster, a potential fire risk/battery explosion. This is done for safety and one of the many reasons why using a Car style supposedly 'smart' charger, like a CTEK, in a Motorhome/Caravan should be done only with great caution. The smart XS 10.0 charger manual states the same as do most of those we have seen. See the bottom of the page for the manual and the Timers that apply to each phase. However, some of the newer Car battery chargers are adopting Timers for safety reasons. The charger used in more Motorhomes and Caravans world wide than any other, is the Schaudt Elektroblock LAS 1218 charging module. It is an 18amp charger which gives an output of 14.3v at an average rate of roughly 12amps for 4 hours (just 1 hour on some early versions). It then drops down to a much slower 13.7v 'trickle' charge rate, even if the battery bank is still only half charged. So if the battery bank is big and needs 100Ah to charge up, it will get an average 12amps x 4 hours = 48Ah before the charger drops to it's 'trickle' 13.7v mode. The 52Ah deficit will be replaced at a rate designed to be a 'Maintenance/Trickle' charge of 13.7v and very low current, often less than 1 amp, obviously taking a long time. So where the Motorhomes standard fit single 100Ah battery discharged to 50% DOD (50Ah taken out) will pretty much get fully charged in 4 hours, if you add a second battery the combined 100Ah that now needs to be put back might take 50 hours plus, or more than 2 days. Clearly, to allow for inefficiencies in the battery, it would be sensible to leave it on charge for about 3 days. That is very different to the 'overnight' charge that many seem to think will be enough for 2 x 100Ah batteries. Taking the battery bank up to 4 batteries will clearly magnify the effect again with a potential 6 day + charge time. Obviously discharging the same battery bank heavily down to 80% discharge will not only create extended charging times of over 10 days, but place a very different strain on the charging systems. Battery manufacturers say that batteries should be recharged soon after a discharge, or degradation will result. You can see how a battery bank that has been run down slowly over a 6 day period with a further 5 days to charge back up might not be utilised in the ideal way?. That is a long time for battery Sulphation to take hold, especially so if the batteries are discharged to very low levels. The above is just a basic illustration, the real World is more complex with other factors that can lead to charge times in weeks. These we will now cover for those interested. There are a vast array of different types and makes of Battery chargers used in Motorhomes and Caravans around the World, often with different functionality. Here we will examine two typical units, a very basic type, then a more sophisticated unit. For example the Sargent Supercharge 151 (launched in 2016) is a fixed 13.5 volt, 10amp charger where the voltage is permanently set at 13.5v but the current varies dependent on the batteries requirement and the charger temperature. When this charger starts up, it begins putting 13.5v into the battery at a peak current of 10amps, more usually an average of 6 - 8 amps. As the battery charges, the current may drop until just a 'trickle' current is being applied to the battery. Although the current changes with demand, the voltage never varies from 13.5v. This limits the power of the charger significantly, resulting in slow charging even on a small battery bank. Rarely does the battery get to 100% charge, 85% is more typical. This is how almost all chargers worked up to the 1980's. Modern chargers with a higher 14.4v voltage were introduced to speed up charging. However, continual charging at a higher 14.4v can result in battery Plate corrosion which reduces battery capacity and shortens it's life. So it was determined that 3 stages should be used where charging takes place in 3 steps with the final one a lower 'maintenance' charge or Float voltage. The 1st Stage was just an initial charge on a Flat battery to wake the battery up, with the 2nd stage the main phase done at 14.4v. Once the battery was charged, it dropped to the 3rd stage and a 'less corrosive' 13.8v, for the rest of the charge time. A multi stage car charger strictly following the DIN 41773 standard will not have any 'intelligence' or be 'Smart', just invoke fixed triggers for set actions. Later came Smart or intelligent chargers with extra stages that made intelligent decisions based on what was found. For example one charger starts by 'testing' the battery to see how discharged it is, how sulphated it is or checks for suspected damage. Based on the results, the charger will make an intelligent decision to either abandon the charge, start a desulphation charge, jump direct to stage 2 or start at stage 1, etc. Intelligent chargers may contain multiple stages, usually more than 4, but few 3 stage chargers are intelligent, althought the term is often misused. So coming back to our examples, if the battery is tired, it will be less efficient, often drawing more current than usual. So lets look at a more realistic example using the Schaudt LAS1218 charger module as installed in the Elektroblock EBL 99. Example 2 x 120Ah Battery Bank of 240Ah. Lets expand the Habitation battery bank to 240Ah (2 x 120Ah wet batteries) and discharge them to 50%, so they will need 120Ah to charge up. Add on another 10Ah as our battery is unlikely to be 100% efficient. The 130Ah we now need to put in, is way above the theoretical 56Ah we can squeeze in during 4 hours. So after 4 hours the charger will have applied 56Ah at 14.3v, with the remaining 74Ah still to go, at what is effectively designed as a short term 'trickle' rate on some chargers. In a worst case (like on some Motorhome chargers that have a lower 13.6v Float rate) this might take several days, maybe upto 60 hours? If the batteries were Deep Discharged down to 80% DOD, just 20% remaining, then 80% of the battery AH has to be recovered by the charger. If you further subtract 4 amps to also charge a low Starter battery during those critical first 4 hours, then possibly over 80% of the Habitation battery charge might be applied at a snails pace, 13.8v. In a worst case with a big battery bank it could take a week to fully charge the batteries when many people assume they will charge overnight. Agreed it is an extreme example, but use a less powerful 10 amp charger or upgrade to a battery bank of 330Ah, 110Ah x 3, and it becomes anything but extreme. 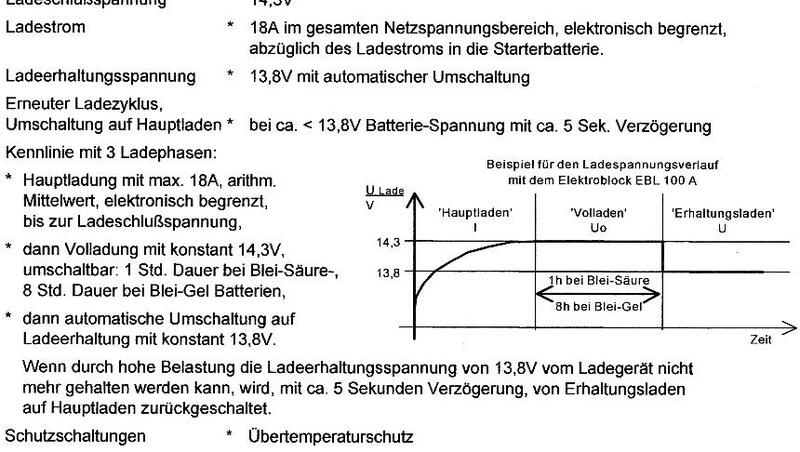 The below extract from an early Schaudt EBL 100 manual shows how the peak 14.3v initial charge is carried out for just 1 hour for a Wet battery before dropping to 13.8v. That is just 1 hour at 14 amps/14.3v with the remainder of a potential 300Ah battery bank being done at 13.8v and around one amp. That could lead to a a 6 day charge time. The above EBL 100 is now quite old, even the legendary EBL 99 has been dropped from the range (although we will go on repairing it) and has been replaced by the new EBL 119 with a very much more effective charger. You will see from the chart below, that while it is still only an 18amp charger, it will charge a Lead Acid Wet/Gel battery for up to 16 hours before it drops to a slower 13.7v Float/'trickle'/maintenance or whatever term you know it as. So in our example above, the newer EBL119 has the potential to charge at up to 14amps for 16 hours = 224Ah. Easily charging most supported battery banks within a day, but remember the practical limit of the unit is still a 180Ah battery bank, it just charges that 180Ah battery bank more effectively. You will see from the JPEG above that the explanation of the three charge phases, just below the chart, describes the workings in the way we say, although we have some understanging issues during the translation from German. You will see the 1st stage is primarily for a flat battery. 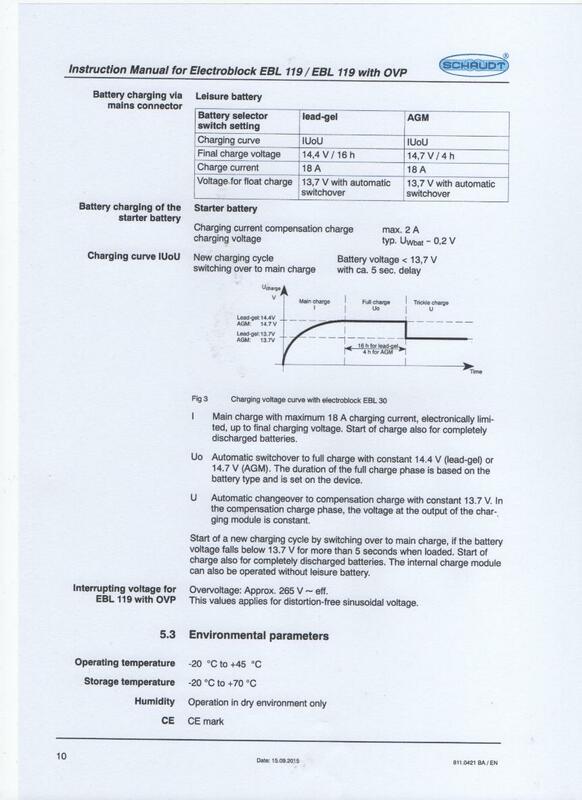 It states for the second 'Full Charge' Uo phase that the "duration" for this main charge phase is determined by the switch setting for the battery type. It clearly doesn't say it is determined by the voltage or the current being drawn like it is on a Car battery charger. You will notice that although AGM batteries get a higher voltage rate, the timer is just 4 hours before it drops down to Float, showing that although this is an AGM adapted charger, an AGM dual battery bank discharged heavily could take at least twice as long to charge as a wet battery bank. Note also that the bulk of that will be at an AGM battery damaging 13.7v, not the 14.7v an AGM needs for long life. We had an email from George Zekan in December 2018 explaining he had a 'Real World' issue with an early 1 hour 'Boost 14.3v' charger that demonstrates the limited charging time issue well. "I have a Pilote Motorhome, with an early EBL269 and one leisure battery, and live on the road full time. I found out that when I connect my motorhome to mains power, the charger runs at 14.3V for only one hour then changes over to float voltage (13.8V). Do you think this is a fault or just the normal charging cycle? 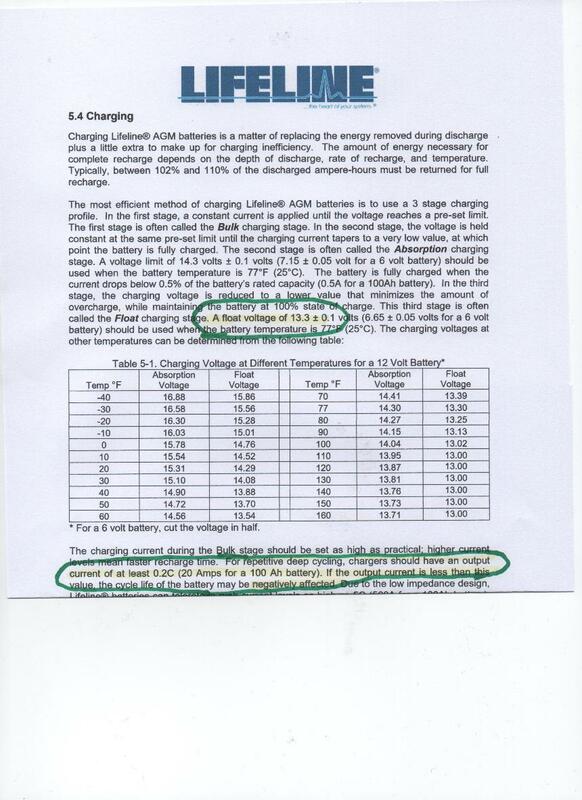 Schaudt said some older versions of the EBL269 only have a 1 hour 'Full' Charge. I am often only on mains power for 3-4 hours at a time, and my leisure battery is often down to 50-60%. On the existing charging cycle of only 1 hour on Full Charge, there is not enough time to charge my battery fully. I would like to get more charge into the battery quickly. Do you think I could change over to the Gel charging cycle (with it's longer 8 hour Timer) without damaging my battery? I tried to ask Schaudt about this but they were reluctant to recommend charging a lead-acid battery on lead-gel. I think the only difference in the charging cycle is that lead-gel does a full charge for 8 hours instead of only 1 hour". You will note that Schaudt confirms the charger is working as designed by dropping to 13.8v after the 1 hour Timer expires, even though the battery is no where near full capacity. We advised that because he spends so little time on mains EHU, and because on these chargers the only difference is the charging 'Timer' interval (not the usual voltage changes as well) that he would be ok switching to Gel to get an 8 hour 'boost' 14.3v timer. Remember that in this phase while the voltage is 14.3v for longer, the current will reduce to almost nothing once the batteries are charged. We do not recommend this course of action with budget batteries. Only Varta LFD90/Yuasa L36-EFB high quality and strong construction batteries. Some Solar Panel charge Regulator/chargers also behave in the same way, in that the first phase they enter on 'waking up with the Sun', is a 'Boost' phase of 14.4v for x minutes/hours. This may last for 1 - 4 hours before dropping to a 13.8v float charge, regardless of the battery charge state. Just because the Solar display is showing 13.8v by 11:00 in the morning, does not necessarily indicate the batteries are fully charged, just that the 14.4v timer has ended and dropped into 'Float'/'Trickle' mode. We don't know one Solar regulator that 'wakes up' each day in the same charging profile that it ended with the day before. So the above demonstrates that while a charger has no physical limit, it can have a practical limit on the size of bank it can support. The golden rule for wet acid batteries is usually 10 times the charger current output converted to Ah. E.g. a 18 amp charger supports a 180Ah battery bank. In the photo below of a Calira 20amp charger the same supporting evidence is printed on the casing. It states it is suitable for a total battery bank between 70 - 200Ah only. Remember this is the Total battery bank size and this unit, as per most good chargers, also charges the Starter battery so an allowance should be made for this. Some people will tell you that if you add extra batteries to a charger and exceed it's capacity, all that happens is they take longer to charge. Yet those same people will be the first to point out that asking a 10 amp charger to charge 20 x 100Ah batteries with a measly 0.5amps for each battery would be a ridiculous thing to try and do, which it clearly would be. So everyone can see that a charger does have a limit to the battery bank size it can support, what hasn't always been clear is what those limits are. Getting the last 15% charge into an older battery is no easy task unless the charging conditions are perfect for that battery. Some Motorhome Habitation chargers will not have the power to get a big battery bank up to 100%, if the batteries are a few years old. All battery manufacturers agree on the importance of recharging a flat battery quickly. They talk in hours, not days. Any failure to look after the battery correctly will result in a lower effective capacity for that battery bank, strain on the charger and battery deterioration. As the Battery ages, it's load on the charger increases. As a battery ages the situation worsens still further as a battery bank might require a lot more Amp Hours to charge up. The Corrosion/'grid growth' inside a battery, see left hand picture above, at just two years old can be a big barrier to getting amps into a battery. This makes the charger work harder for longer. Obviously a big new battery bank, that is already giving a charger a hard time, becomes an even bigger burden after a couple of years. It is usually at this point that an overloaded charger pops. People tell us their particular charger or alternator failure can't be caused by the big battery bank, because "they have been on the Motorhome 2 years without issue". What they mean is they have not noticed an issue, didn't hear the poor charger screaming it's Heart out, running much hotter for longer than designed until it finally threw in the towel. Nor do they take into account the ever increasing burden as the batteries age, they tend to think of a battery as a static, unchanging load, which it isn't. The burden on a charger increases significantly as the batteries age. Poor quality batteries, like almost all the 'budgets', place an even greater burden still. With a 2 x 110Ah 'budget' battery bank, the load after 2 years is not the 220Ah you might think, but more like 270+ Ah because of the way some batteries behave as they age. Lets take a theoretical example of a 110Ah budget Antimony based battery placing a load on all the charging systems as the batteries age. It might be a 110Ah load for the first few months, but by the time the battery is 2 years old it may behave more like a 160Ah battery in terms of the load on the charger. So if we fit 2 x 110Ah new budget batteries, by the time we reach 2 years the actual charger load might be more like 160Ah x 2 = 320Ah. That is a huge load for any Alternator, wiring, relays, connectors to try and look after, let alone the mains charger. How big can the load on the Charging systems get? Imagine a battery deteriorating to the point it is approaching a 'Dead short' load on each cell? That might be almost akin to someone putting an Iron bar across the Alternator output terminals. All of the theoretical 'Laboratory behaviour' of a battery and charger changes totally in the real World as battery Corrosion and other faults develop. The budget batteries behave massively different compared to the best. Ultra efficient batteries, that charge up more easily and quickly, placing a lighter load on the charger over time, become an even more important factor if you expand the battery bank. See our Battery Technology page, the best modern batteries are only £105, yet streets ahead of the competition. So while we quote the 10 times rule, it is obvious from the examples above that the 5 times rule is more realistic to maintain reasonable charge times without overloading the charger. However, we are also very aware such advice would never be accepted by the majority who already seem to find the '10 times rule' extreme. One of the reasons we say an allowance should be made for the Starter Battery, which can take 6 amps charge on the EBL 220, is because this helps make the figures more realistic. Additionally a buffer is created if the Motorhome is ever in the position where both are charged at the same time. That doesn't mean adding on the full 90Ah starter battery value to the battery bank, but to make an allowance for it depending on your set-up. If you upgrade the battery bank with quality, modern low corrosion batteries and then follow the 10 times rule with an allowance for the Starter battery with due regard for the extra load you are placing on the whole infrastructure, then the mains charger should be reliable. Things You Might Want to Think About If Increasing The Battery Bank Size, Even Slightly? See near the bottom of this page look out for the the image of a giant Relay, for advice on upgrading the battery bank size and tips on how to charge them faster if you do. The chart below of a CTEK Smart charger shows how the timers work on these. You will see that each phase has a limit to how long it will stay in that phase. 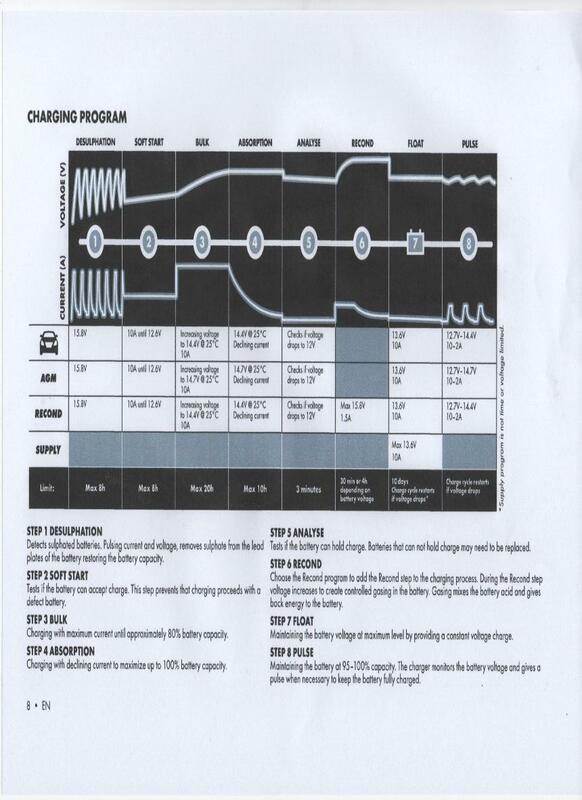 Although the phases on Smart chargers may be current or voltage triggered before moving on to the next program, there is also an overall timer limiting the time of each phase. See the timer figures at the base of each column. The CBE range, like the CBE 516 works differently to most chargers, see description below. 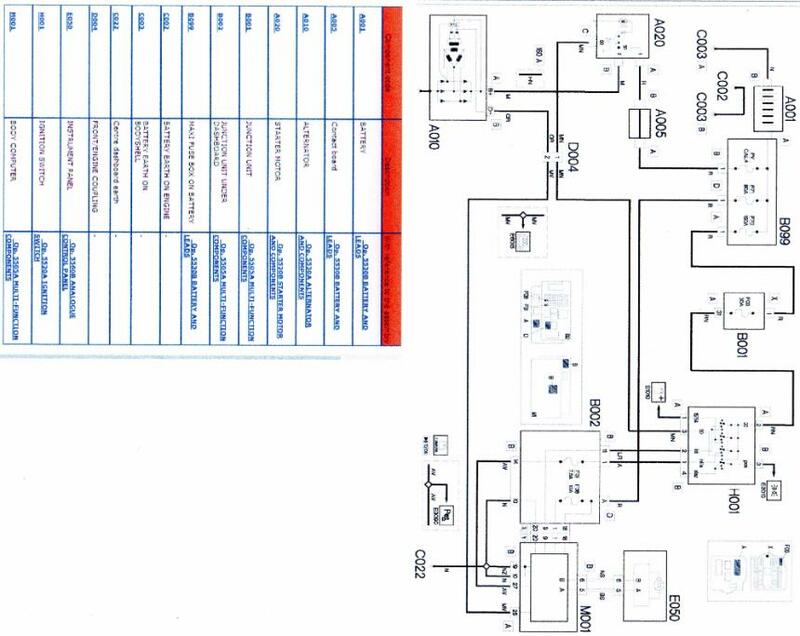 Note the error in the manual where CBE have transposed Gel and Wet batteries charging voltages. The charging voltages on the Gel program are the correct ones for Wet batteries and the 'Wet' setting is more appropriate to Gel batteries. We therefore suggest that for the Yuasa L36-EFB and the Varta LFD90, they are charged on a 'gel' setting to ensure they get the higher 14.4v faster charge voltages without damage. The CBE manual 'Wet' setting only charges at 14.1v which is more appropriate for Gel batteries.